Digital Gujarat Online Scholarship Login & Registration: Gujarat government is Digital Gujaratwww.digitalgujarat.gov.in. which will provide several such services on the lines of e-services already being rendered through digitalgujarat.gov.in. Earlier, when the common services portal wantials before being registered. People of Gujarat would soon be able to avs launched, people were still required to visit nearby Jan Seva Kendra to verify their credeail a host of government services through their smartphones and tablets, with the state government deciding to launch a mobile application for the same. WHEN ALL STUDENT WHICH ARE INCLUDED IN YOUR SELECTED SCHEME ARE ADDED..
TILL YOU CAN NOT SEND IT TO HIGHER AUTHORITY....YOU CAN DELETE IT ANY TIME AND CREATE ANYTIME AFTER EDITING YOUR DATA. The student will contact to their respective institute. Printout of the application can be taken with “Barcode”, after locking and forwarding the application which is to be submitted at the Institute. 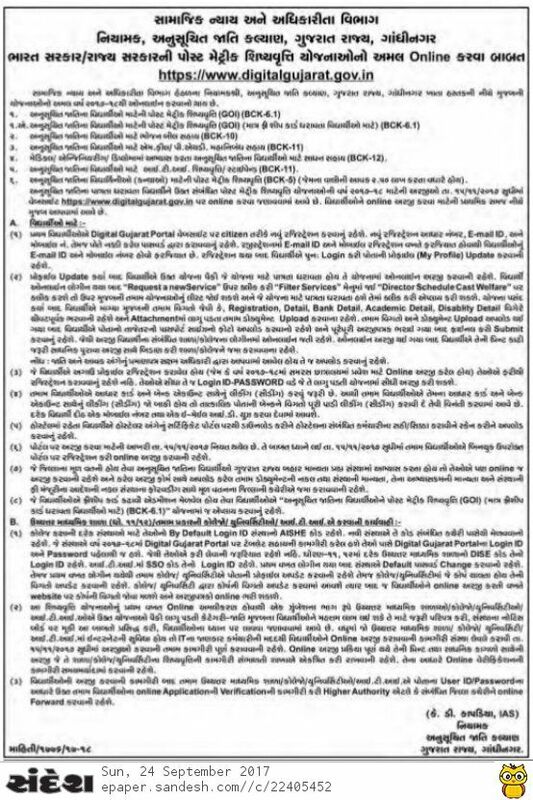 Unless the date is extended you cannot apply as the digital Gujarat portal will not allow registering so please do it in time. You have to approach to your institute and inform about the error so that there will be a Permanent rejection of your wrong application.